The reaction would include one or more of the following: Facepalm. Mouth agape followed by a breathy “O.M.G!” An incredulous “WTH?” (or other similar letters). Hysterical laughter. Some might even run to her aid to protect her from herself. But many of those same people who recognize the danger and stupidity of this monkeying around on the lat pull-down machine will turn around and go to an indoor cycling class in which they ignore all tenets of biomechanics, exercise, and cycling science. They will rationalize that it’s OK because “we’re not cyclists” or “this is not cycling.” They won’t draw the parallel with this woman’s dangerous lifting antics in the video above. The 13 Worst Fitness Instructors Ever! Let’s take a vote…who might wear these? 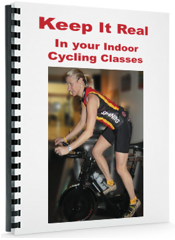 Don’t like Lycra, but still want to be comfortable on an indoor bike? People obviously think it’s a good idea—as of today (9/1/13), it’s almost reached its fundraising goal! Check out the description on Kickstarter. Register and receive a list of 265 80's cycling songs and six 80's-themed profiles FREE!